This year, iGEM team Paris has made a piece of software to analyze the word content of iGEM wikis. We initially wanted to try to use this software to predict who would win iGEM, but as it turns out it is useful for lots of other fun things as well. To analyse the wikis, we have implemented an algorithm that uses Statistically Improbable Phrases (SIP) to try and extract the meaning of a text, an approach which has been used recently by Amazon to find relationships between books. An SIP is a word that appears with a higher frequency in your target (whether it is a book, or an iGEM wiki) than in a large dataset of background text. For example, a book about detectives might have "tweed jacket" or "corncob pipe" as SIPs because these words appear often in the book, but are not common words in the general corpus. f the frequency of the word in the target : f = o/n (o is the occurence of the word, and n the number of words in the wiki). F the frequenc of the same word in a large sample : F = O/N (O, occurence in the sample, and N the number of words in the sample). f/F is the "improbability factor" of a given SIP candidate. Our algorithm uses all iGEM wikis as a background dataset, and then tries to find SIPs for each individual wiki. 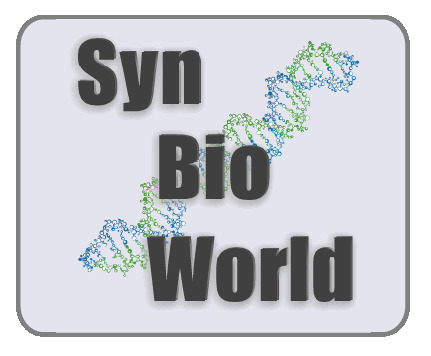 By using all of the wiki's text put together as a background, we are able to discard words that would be SIP's in a more general sense (clone, miniprep, igem) and instead focus on the words that make each project unique. Our software's workflow is essentially as follows: We use wget to retrieve all of the wiki pages from the iGEM server. We strip all non-alphanumeric characters and convert all remaining text to lower case. Finally, we compute the relative frequencies of each SIP in an sqlite3 database. 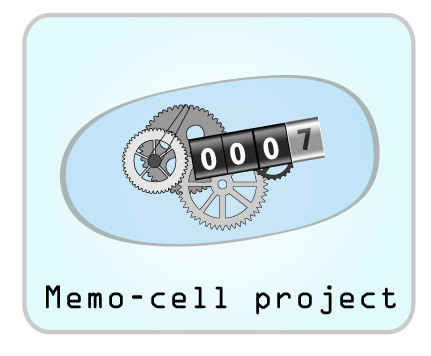 We have extracted and calculated this for the last 3 years of iGEM, the data is available under the Download tab, for you to play with if you like. 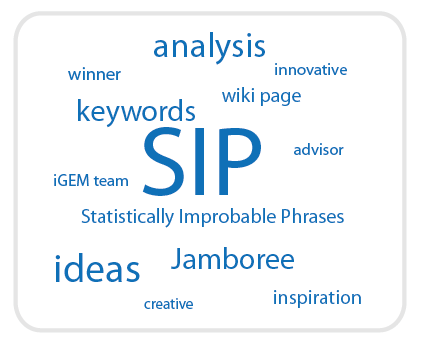 We have used a visualization app called Wordle to visualize our SIP results. Some of the graphics we made can be viewed under the Results tab! In the future, we intend to make use of the ENTREZ API to get SIP data on each instructor's research output, and then compare the SIP's of instructors to those of their team to get an idea of how an advisor's research path influences their team's work. We are interested to see how teams that do projects wildly divergent from their "mother-labs" do in iGEM. One other idea we had was to try to predict the future winner of the IGEM competition using our software. Basically the idea was to find SIPs for all the previous years' winners, giving them a coefficient depending on the prize the project got. Once this done, it is possible to compare each wiki with this database of "winning" SIPs. Will this comparison give clues for the future winner ? To our mind, it will be interesting to know... But it still has to be implemented. We very much hope that other teams will make use of the data we've generated to run some of their own analyses!